Do We All Live in Haunted Houses? The Stanley Hotel became our most ambitious effort to date. The hotel, built from 1907 to 1909, sports 138 guest rooms, a SPA, a concert hall, bar area /dining room and has had millions of dollars devoted to renovation. As coincidence would have it, the Travel Channel had their "Most Haunted" team at the hotel the day we arrived. 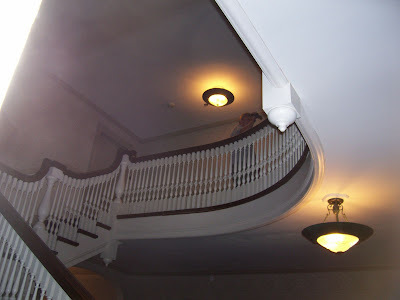 They were beginning their "Most Haunted USA" tour by filming at the Stanley. As it turned out, we were able to meet several of them and they proved to be very cordial. In the afternoon of the first day, we began our tour of the hotel, taking pictures, getting base EMF and temperature readings for later comparison. As part of the process, we were taking a picture of room 217 (famous for Stephen King's visit) when the door opened and Karl Beattie saw us and invited us in. Karl is married to Yvette Fielding and together they are the creators and hosts of "Most Haunted". Karl is a co-owner of Antix Productions, the director and a cast member. Yvette is listed as the "presenter". Below are pictures of that encounter. As you can see, Karl was about to do something but, instead, took the time to show us around. As a footnote to this, that evening, while Megan and I were in the basement, the cameras started rolling and the "Most Haunted" team started down the stairs from the lobby on their way to the "tunnel". As the staff was trying to "push us" aside (Gently. but firmly), Karl saw that, and while holding a camera and directing action, pointed at us and instructed them to leave us alone. What more can I say? "Cheers" to the "Most Haunted" TV show and team. That evening we began the hunt in earnest. 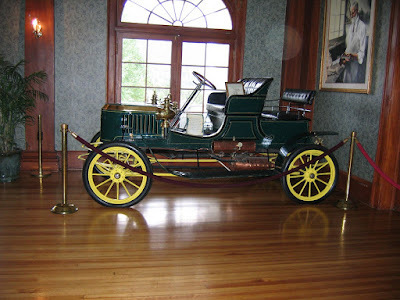 My very first picture inside the lobby of the hotel yielded a very large orb residing by the Stanley Steamer. Could it have been F.O. Stanley watching over his auto or something much less interesting - as in a dust particle...? I vote for the latter. The most paranormal activity in the main hotel occurs on the fourth floor. Earlier in the hotels' history, the fourth floor was designated as the servants quarters. This is where the little boy and girl made famous by "The Shining" supposedly play - sometimes with a red ball. It is thought they were the children of a servant woman. They did not die in the hotel but came back as this is where they were most comfortable. There is also said to be the ghost of a man who opens and closes the closet door in room 401. In 412 it is said a woman went temporarily out of control due to the presence of a demon entity. There are stories of other rooms - 407 - 418 - the list goes on. We've already mentioned room 217. There are stories of the third floor as well in rooms' 318 and 340. It's pretty evident that the hotel has a smorgasbord of potential paranormal locations. We went floor by floor with all meters and gauges running and taking hundreds of photos and video. It wasn't until Megan began an EVP session near room 401 that we got our first piece of evidence. Sometimes it doesn't pay to be the lead investigator. We never saw the mist swirling in the stairway between the third and fourth floors. Looking at this picture now, it reminds me of an old Ray Milland movie called "The Uninvited". Above is my favorite picture taken that night. Something is "on" or perhaps "reaching for" Megan. There appears to be a "golden rod" coming down at a 45 degree angle past her right knee and into the floor by her camera. You could skeptically say my camera was moving but, if it was, you would not be able to read the JVC logo on the hand strap or the writing on her shirt. For reference, we tried to duplicate this the following night once we knew we had this picture. We could not. This was taken outside of room 411 - close to room 412 and at the end of the hallway where, halfway down, room 401 resides. 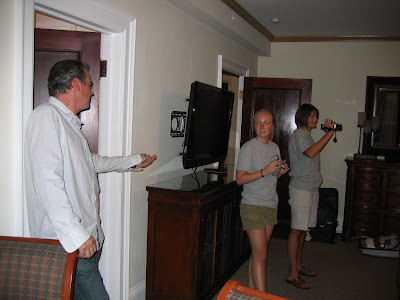 At the very end of the first nights investigation, we befriended Billy Ward the concierge of the hotel. 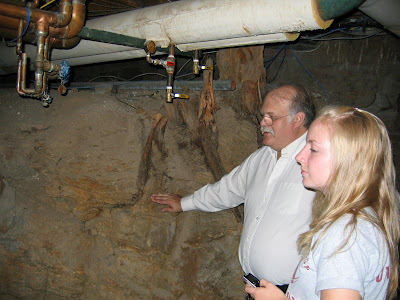 Billy has played host to the "Ghost Hunters" and numerous other investigative efforts. Billy was on duty that night to assist in the filming for the "Most Haunted" series. I asked him how we could get into the tunnel without taking the Ghost Tour. He said: "See me tomorrow". And, so, we did. Billy lived up to his word and took us down to the scene of the remarkable events of the "Ghost Hunters" Live Halloween special in 2006. He took the time to give us his own guided tour for a good 30 minutes. Megan wound up crawling back under the foundation to where Jason and Grant heard the girls' voice (now presumed to be Katie, daughter of a hotel worker) laughing and saying "hello". An EVP was captured inside the "cave" in the employee tunnel. Megan entered with her digital recorder turned on. Out of nowhere we hear Megan's name as if being called. Shortly after that Megan calls out for Katie and we hear the name Katie repeated in what sounds like a young female voice. "Miracle babe" & "I'm mad"
Also notable in the billiards room was the EMF readings which went anywhere from .2 to 2.0. They flickered around constantly. The room was apparently very active. Billy probably has every reason to "get the creeps" from this room. 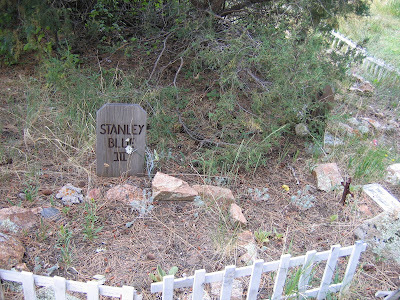 As a bonus, included below, is a picture of the PET CEMETERY which resides behind the hotel. Very few people know it's there and even fewer pay their respects to the deceased Stanley family dogs. The hotel staff is less afraid of the pet ghosts than they are of whatever lurks inside the walls of the Stanley. (NOT the inspiration for King's book, "Pet Cemetery"
As a final note, I asked Billy what happened the night before with the "Most Haunted" filming. He said they caught the closet door closing in 401 with cameras inside and out. He also said that they decided to use a Ouija board in 217. Yvette thought she heard "growling" in the room and demanded a new room. Billy indicated that sometimes raccoons get into the walls and can make sounds that might sound like a growl.